And is forced to crawl like a baby down on the floor. All that is precious to you and to me. And know that he would die just to save me and you. ROME TOWNSHIP - - A light snow began to fall Saturday as the ashes of fallen Rome Township Volunteer Firefighter Steve Olinik Jr. were carried onto the fire engine taking him on his final ride. Olinik, 65, of Dorset Township, died March 30 after suffering a heart attack while responding to a fire call on March 29. "We had a couple of calls that day," said Rome Township Fire Chief Ed Koziol. "He went home after the first call and came back to respond as mutual aid to Orwell." Koziol said when Olinik arrived at the fire hall, the first vehicle had already left and a second crew was standing-by to see if additional help was needed. Olinik greeted the other firefighters and collapsed. Firefighters and emergency personnel at the station administered resuscitation efforts until South Central Ambulance District personnel arrived to transport him to Ashtabula County Medical Center, where he died at 5:30 a.m. the next day. 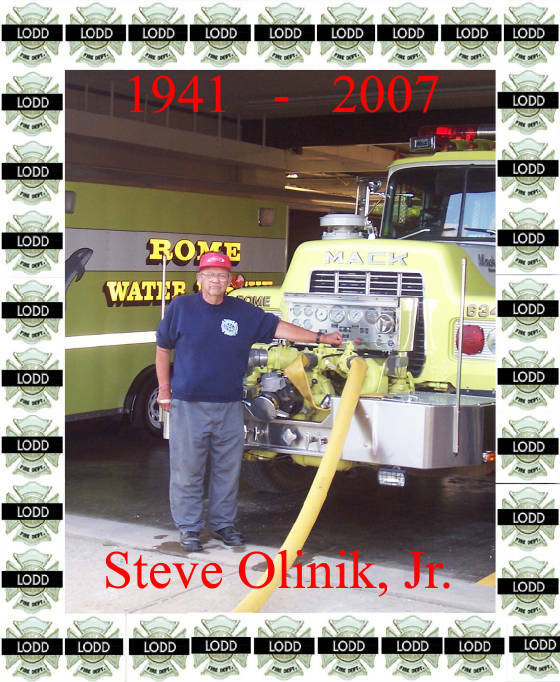 Olinik began his career as a firefighter with the Saybrook Township Fire Department in the 1960s. He then volunteered with the Dorset Township Fire Department before joining Rome in 1989, Koziol said. Olinik also worked for the New Lyme Township Road Department for 15 years before retiring in 2004. Firefighters from all over Ashtabula and Geauga counties participated in a memorial service for Olinik, held at the Rome Township Fire Hall. One-by-one, members from each department passed by the urn holding Olinik's ashes one final time, saluting their fallen brother. "Steve's life was short, comparatively, but he lived it to the fullest," said the Rev. Julie Hanneman of Cherry Valley United Methodist Church, who officiated. Koziol, during his eulogy, said Olinik was very proud to be a member of the department. He was very active in training drills and the school program. Olinik also was very supportive of the junior firefighter program. He was a member of the Roman Candles Auxiliary, unselfishly volunteering his time, he said. "I will remember Steve as not only an active member of our fire department, but as a good friend," Koziol said. Outside the fire hall, in true tradition of a firefighter's funeral, aerial trucks from Orwell and Middlefield served as a back-drop with their ladders raised to form a pyramid. A large American flag hung from the apex. Firefighters lined up, saluting as Olinik's ashes were carried past them with the faint cry of bagpipes resounding in the air. The Rome Township Fire Department led the funeral procession, passing under the crossed ladders en route to Brownville Cemetery in New Lyme Township. Olinik was buried with full firefighter honors, including the traditional bell ceremony at the cemetery. The ringing of the bell represents the end of an emergency and the return to quarters. A bell tolled three times each, three times, in memory of Olinik and in tribute to his years of service. As the final bell rang, an alarm sounded over the firefighters' communication radios announcing Olinik's death, "This is the Rome Township Fire Department striking the last alarm for Steve Olinik who served for 19 years."